Pedestal Is Part Of The Mayline Medina Series With Contemporary Style And Elegant Functionality. Clean Lines, Curved Shapes And Floating Worksurfaces Reflect Italian Design Influences. Gray Steel Laminate Finish Ensures A Beautiful Collaboration With Other Mayline Furniture And Complements Most Any Decor. Laminate Is Stain-Resistant, Water-Resistant And Abrasion-Resistant. Both Box Drawers And The File Drawer Operate Smoothly Using Full-Extension, Ball-Bearing Suspensions. File Drawer Accommodates Both Letter-Size And Legal-Size File Folders With Included Hangrails. 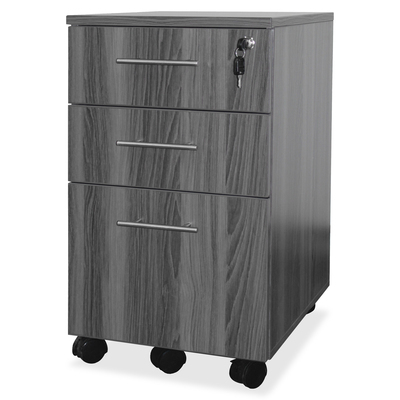 Durable Pedestal Fits Under Credenzas And Rolls Smoothly On 2" Dual-Hooded Casters. Ganglock Features A Removable Core For Locking All Three Drawers. Finished Top Surface Offers Another Surface For Storage When You Situate The Pedestal Next To Your Desk..